Stephen Riley Photography: Somerset: OK, so I had to photograph it! OK, so I had to photograph it! Sometimes you have to go for the obvious. And I guess that’s no bad thing from time to time, as in other aspects of my work I’ve been accused of being too obscure. 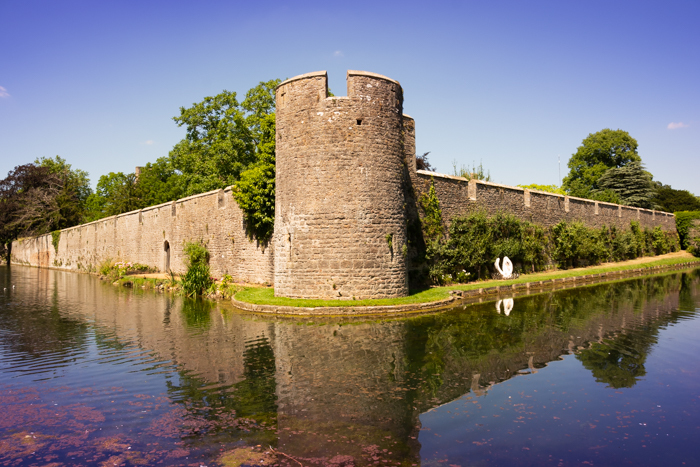 This is, of course, the wall and moat surrounding the Bishop’s Palace, adjacent to the Cathedral, in Wells; and every Somerset photographer has to have a crack at it. So here’s my effort. I’m based in Bruton, but cover the whole of Somerset, as well as much of Dorset and Wiltshire, and each of the local towns had its own special bits that photographers are drawn into shooting for their portfolios, or at least are expected to shoot. Wells has more than most. I also visit these places for the same reasons everyone else does - for fun and relaxation - but it does tend to be camera in hand. I suppose, as an architectural photographer (amongst other things), I have more excuse than most for this kind of shot. For all that the first semiotic message this scene gives off is ‘history’, at some point someone sat down with a quill and parchment and set out a design for the craftsmen to work to. It is architecture, even if the name of the architect is lost in the mists of time.